The development of a baby’s brain is a complex, ongoing experience, and there is not a single toy that can accomplish the job on its own. To sufficiently stimulate the brain of an infant a variety of incoming experiences and multi sensory (smell/taste), visual, verbal/auditory, and tactile (physical) stimulus need to be continuously provided. By the time children are about one and one-half years old, personal exploration to objects (like toys) in their environment becomes extremely important. 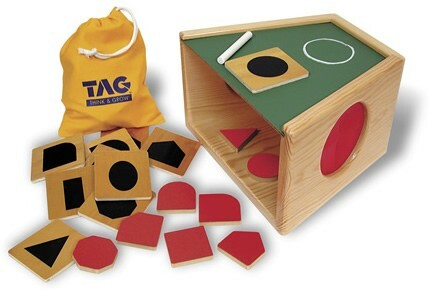 Mental images imprinted in their memory through tactile sensory experiences become much more efficient than through the visual or auditory modes, and toys like the TAG Toys Mystery Box fosters this stage of cognitive development. Toys like the Mystery Box provide for a wide range of tactile experiences from basic shape recognition to fine size and shape discrimination. 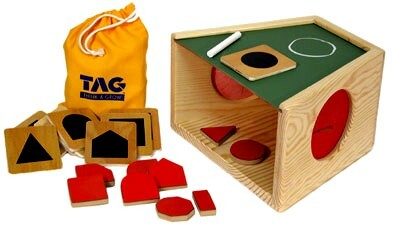 This learning center comes with 10 solid wood shapes and 10 matching shape tiles, and chalk for drawing exercises that develop fundamental memory skills, helps sharpen mental focus and heightens attention to details. Find TAG Toys on Facebook. This entry was posted in Babies, Childhood, Childhood Development, Children, Education, Infants, Kids, Pre School Kids, Toddlers, Toys, Uncategorized and tagged baby, cognitive, growth, mental, mind.